Keith represents large and small businesses, and business people, in nearly every kind of business dispute, including significant “bet the company” cases. Examples include claims involving breaches of contract, interference with business relations, defamation, fraud, covenants-not-to-compete, and corporate and partnership disputes. He has represented many technology companies in software development disputes, licensing disputes, and other intellectual property matters. Keith is very experienced with noncompete agreements and claims of stolen or misused information. He fully understands that some noncompete agreements can unnecessarily—and perhaps unlawfully—prohibit employee advancement, a well-drafted agreement holds up in court. Whether drafting, reviewing, or litigating a noncompete agreement, Keith will ensure the client’s rights, as well as crucial trade secrets, are protected. Keith has a very active professional liability defense practice. He is a true lawyer’s lawyer and has successfully defended many of Utah’s most prestigious law firms. He also represents insurance agents, accountants, appraisers, engineers, design professionals, and healthcare professionals. Keith is well-regarded by his peers in the legal profession. In 2014, he received a Distinguished Service Award from the Utah Chapter of the Federal Bar Association. He has spearheaded and continues to lead the Utah Bar Litigation Section’s efforts to recruit and train more lawyers to serve as guardians ad litem – attorneys appointed by the court to represent the best interests of children in highly contentious family litigation. He also serves as a guardian ad litem himself. 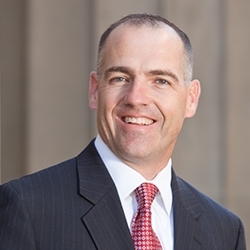 Since 2010, Keith has provided guidance to Utah lawyers via a regular column, “Focus on Ethics and Civility,” that appears every other month in the Utah Bar Journal. Keith is a member of the firm’s Board of Directors. *Peer review Rated Lawyer of AV® Preeminent™ 5.0 out of 5. * *AV® Preeminent™ and BV® Distinguished™ are certification marks of Reed Elsevier Properties Inc., used in accordance with the Martindale-Hubbell certification procedures, standards and policies. Martindale-Hubbell is the facilitator of a peer review rating process. Ratings reflect the anonymous opinions of members of the Bar and the Judiciary. Martindale-Hubbell Peer Review Ratings fall into two categories – legal ability and general ethical standards. Former Trustee v. Law Firm and Lawyer – Prevailed on motion for summary judgment, obtaining complete dismissal of $1 million claim against lawyer and law firm based on alleged breach of fiduciary duty and negligent conduct. Decision was affirmed on appeal in the Utah Court of Appeals. Lead attorney in case involving separation of two members of a limited liability company. Obtained $1.1 million arbitration award for client, including over $400,000 in punitive damages. Zip Line Manufacturer v. Zip Line Manufacturer – Obtained favorable settlement in patent infringement and business tort case. Client obtained patent inventorship rights in disputed patent and favorable license agreement for another patent owned by client. Individual v. Lawyer – Prevailed on motion to dismiss claim against lawyer based on alleged negligence in failing to pursue claim against residential tenants. Bank v. Real Estate Appraiser – After filing motion to dismiss, obtained a settlement for fraction of estimated defense costs for commercial real estate appraiser accused of making a negligent appraisal and misrepresentations. Individual v. Real Estate Appraiser – Obtained dismissal of claim against a residential real estate appraiser based on an alleged negligent appraisal and alleged misrepresentations. Property Maintenance Company vs. Lawyer – Prevailed on motion to dismiss $8 million claim against lawyer alleging that lawyer engaged in civil conspiracy with client to breach contract. Lead trial attorney in bankruptcy trial in which client contested amounts owed in legal fees to law firm due to, among other things, breaches of fiduciary duty. Case settled favorably after cross-examination of opposing law firm’s lead witness. Favorably settled patent infringement case for fraction of demand. Plaintiff alleged violation of software patent. Favorably settled several non-compete cases, some after preliminary motions. Participated as a trial attorney in the trial of a multi-billion failed merger agreement. The case was tried in the Delaware Chauncery Court and was one of the most discussed cases of 2008 among the Wall Street community. Clothing Manufacturer v. Nationwide Retailer – Obtained dismissal of claims against nationwide retailer. Retailer had been accused of fraud and breaches of a complex licensing and clothing supply agreement. Small technology firm v. Huge Technology Conglomerate – Brought claims for copyright and misappropriation of source code on behalf of a small software development firm against a huge technology conglomerate. Successfully negotiated settlement and license agreement that was enormously beneficial to client, the terms of which are confidential. Client v. Lawyer and Law Firm – Defended a lawyer accused of egregious acts of malpractice. The case settled for a small fraction of the settlement demand after discovery and summary judgment motions. Represented company which brought claims for trademark infringement. Case settled on appeal after successful preliminary injunction trial. Opposing party ceased use of infringing trademark on infringing product. Represented buyer of car dealership who was sued for breach of contract by seller. Successfully defended buyer and prevailed on counterclaim for fraud at trial. Successfully defended appeal. Seller eventually paid full amount of judgment on counterclaim. Registered Dietitian Firm v. Registered Dietitian Firm – Successfully defended a national registered dietitian firm against claims of misappropriation of trade secrets, including menu and nutritional programs used in nursing homes. The case settled with no payment by the client after an evidentiary hearing. Outside of the office, Keith loves the outdoors and enjoys skiing, mountain biking, backpacking and almost any other outdoor activity. In re Heil – represented debtor in contesting substantial attorney fee request in bankruptcy proceeding. Trial involved claims of attorney misconduct. Aegenis Group v. Dahn – represented one member of closely held corporation in dissolution proceeding against other shareholder. Multi-day arbitration trial resulted in large monetary judgment in favor of client. Graf v. Williamson – represented one member of limited liability company in dissolution proceeding against other member. Multi-day trial involving ownership rights and company valuation. Obtained favorable monetary result for client. The Canopy Group v. Computer Associates International, Inc. – Represented plaintiff in an action brought against Computer Associates for breach of contract, violation of the Lanham Act and other tort claims. After the jury was selected, the case settled in favor of plaintiff for an amount reported in the press to be $40 million. Equity Labs v. Sorenco Laboratories – represented manufacturing company in dispute over commissions allegedly owed to former salesperson. One-week jury trial. Hexion Specialty Chemicals v. Huntsman – part of trial team in a two-week multi-billion dollar trial in Delaware Chancery Court. The case revolved around a failed merger agreement between two of the world’s largest chemical companies. Larken Inc. v. Frontier Recovery Services – successfully represented client at trial in collection matter. Larry J. Coet Chevrolet v. Labrum – represented defendant in contract dispute. After bench trial, court dismissed claims against client and entered judgment on client’s counterclaim for fraud. Radmall v. Wicat – represented manufacturing company in dispute over commissions allegedly owed to former salesperson. One-week bench trial. Stone v. Everin – represented real estate developer accused of embezzling funds at evidentiary hearing trial involving request for pre-judgment writ of attachment. Silka Corp. v. Martinez – on a pro bono basis, represented a tenant wrongfully accused of breaching lease and facing eviction. At bench trial, court dismissed opposing party’s claims and entered judgment on counterclaim for abuse of process in favor of client. Kilpatrick v. Wiley, Rein & Fielding, represented plaintiff group in a three-month jury trial against law firm who had conflicts of interest and breached duties owed to clients. Jury awarded 8-figure verdict in favor of clients. Ball v. Hartwell Corporation – represented departing employee and subsequent employer in case alleging trade secrets and breach of non-complete agreement. Bench trial on motion for preliminary injunction. HPSI v. Crandall – represented national dietary consulting firm accused of misappropriating trade secrets. After two-day bench trial on motion for preliminary injunction, the opposing party withdrew all claims. Hub International v. Buckner – represented departing employee and subsequent employer in case alleging trade secrets and breach of non-complete agreement. Bench trial on motion for preliminary injunction. Exceptional Innovation v. Lite Touch – represented home automation system manufacturer in trademark dispute. After bench trial on motion for preliminary injunction, opposing party agreed to stop infringing conduct and pay significant damages. Breton v. Law Firm – PROFESSIONAL MALPRACTICE – 2013 UT App. 65, 299 P.3d 13. Utah Court of Appeals affirmed summary judgment in favor of law firm client. David P. Coldesina D.D.S., P.C. v. Estate of Simper – PROFESSIONAL LIABILITY DEFENSE – 407 F.3d 1126 (10th Cir. 2005). Represented accountant accused of failing to identify misappropriation of ERISA plan funds by investment advisor. Exceptional Innovation LLC v. Lite Touch, Inc. – TRADEMARK INFRINGEMENT – 2007 WL 647847 (6th Cir.). Obtained favorable settlement for client after submitting appeal brief in trademark infringement case. Fire Insurance Exchange v. Estate of Therkelsen – 27 P.3d 555 (Utah 2001). Represented estate of deceased individual seeking insurance coverage for shooting death. Kilpatrick v. Wiley, Rein & Fielding – 37 P.3d 1130 (Utah 2001). Represented individuals who were victims of law firm’s conflicts of interest and breaches of fiduciary duty. Larry J. Coet Chevrolet v. Labrum – FRAUD – 180 P.3d 765 (2008). Court upheld award of attorneys’ fees and judgment for fraud in favor of client. Robinson v. Law Firm – 2016 UT App. 34, 369 P.3d 119, cert. denied, 379 P.3d 1183. Utah Court of Appeals and Utah Supreme Court affirmed summary judgment in favor of law firm client. Trillium USA, Inc. v. Board of County Commissioners of Broward County – 37 P.3d 1093 (Utah 2001). Utah Supreme Court affirmed dismissal of claim against firm client because claim should have been brought in Florida, not Utah.